Habit: Annual generally 5--30 cm, glabrous. Stem: 1--many, erect. Leaf: all basal or few cauline, generally erect, 2--10 cm, 0.3--0.5 mm wide, thread-like, +- cylindric, entire or lobes 1--2, short, thread-like, tip obtuse, red. Inflorescence: +- scapose, head 1; involucre widely cylindric, base rounded; outer phyllaries 2--7, 4--7 mm, narrowly lanceolate, hairs at base yellow or red, glandular, tip red; inner phyllaries 5--8, 6--10 mm, widely lanceolate, acute, margin narrowly scarious; palea 4--5.5 mm, linear to oblanceolate, free from disk fruit. Ray Flower: 5--12; ray 5--15 mm, obovate. Disk Flower: (10)20--60(100); corolla 2--3.6 mm. 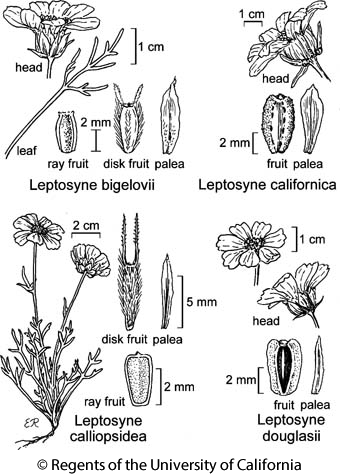 Fruit: ray and disk fruits alike, 2.5--4.3 mm, obovate, rusty-tan to light brown or +- red, generally blotched with red or black spots near margin at least when young, puberulent, hairs club-shaped, wing irregularly thickened, corky; pappus 0 (or scales 2). Chromosomes: 2n=24. Synonyms: Coreopsis californica (Nutt.) H. Sharsm. Citation for this treatment: David J. Keil 2012, Leptosyne californica, in Jepson Flora Project (eds.) Jepson eFlora, http://ucjeps.berkeley.edu/eflora/eflora_display.php?tid=30645, accessed on April 25, 2019.
s SNF, s SnJV, s SCoRI, SCo, TR, D; Markers link to CCH specimen records. Yellow markers indicate records that may provide evidence for eFlora range revision or may have georeferencing or identification issues. Purple markers indicate specimens collected from a garden, greenhouse, or other non-wild location.